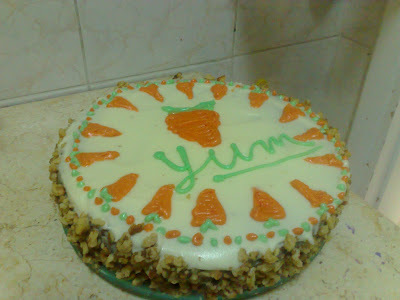 So today I made Jujey's awesome carrot cake. It was easier than I thought, but I had her on msn asking questions all along. I was worried about the icing part because I've never piped anything before but I just kinda winged it. I had a little extra green so Dawood suggested I write something. I thought Yum was appropriate. Next time, I think I will follow the recommendation and double the icing recipe.It wasn't enough to cover the sides and fill with plenty. I used toasted, chopped walnuts around the sides. It was hard trying to do it with the kids hovering over me trying to get a lick of icing every 5 minutes. E loved it too. Ahhhhhhhhhhh that looks awesome!! u did a great job!! did u use the ziplock bag for a pipping bag as i suggested? ur cake looks so yummy and so moist!! U deserve to get spoiled today for making ur family an awesome dinner and dessert!! will there be any left for tomorrow??? yum yum! I can't wait to get an oven so I can cook things like this! Jujey, Thanks! Yea i did, worked well. I do don't I? lol Yea we have some probably will be gone for breakfast. Amalia, get on that! JK. Washi, lol I love puns. Thanks! MJ, you're too kind, I almost didn't post it cause I didn't like the icing but I was like, whatever. Oh, it looks really good!! 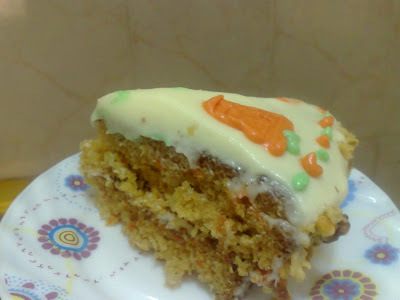 I looove carrot cake, I'll have to try that recipe! Looks moist, too! Good job. Was esp taken by the "Yum...." on the cake hahaha. 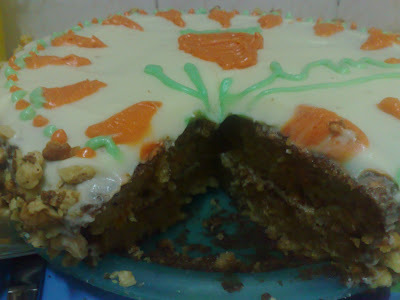 So much so that now I have a craving for carrot cake. what does of cream cheese brand did u use? also do u have a pizza recipe u use with affordable egyptian cheese/pizza sauce that actually turns out good? Burgundy, I used Kiri, it works just as well as Philadepehia for a lot less $. Icing sugar is pretty much everywhere, the brand I get is called Doha. I don't have a pizza recipe but I used to get the ready half baked crust and use Heinz pizza sauce and Domty mozzarella.